Dr. Rudin came to UW Health from Johns Hopkins in 2001. He directed the UW Health Pain Management Clinic for 11 years. An active clinician, teacher, author and researcher, he has served on national and statewide task forces developing guidelines for chronic pain management. He has specialty interests in the management of Ehlers-Danlos syndrome and other hypermobility disorders, chronic pain conditions in general, and electrodiagnostic testing. Dr. Rudin has been recognized for his "understanding, compassion and appreciation of quality of life issues for patients," as well as for excellence in teaching, mentorship and clinical care. 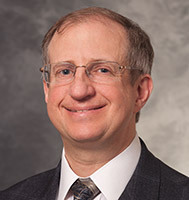 He has served as president of the Medical Staff Board of University of Wisconsin Hospital and Clinics, and as president of the Midwest Pain Society. Dr. Rudin’s research interests include chronic pain disorders, particularly Ehlers-Danlos syndrome, fibromyalgia and spinal conditions, and outcomes of pain rehabilitation.